Gravity Flow version 2.4 is now available via auto-update and for download from the account area. This is a major release that includes a new revert email setting, support for multiple Gravity PDFs, support for Postmark, Sendgrid and Mailgun for more reliable email delivery, Repeater fields, Webhook enhancements, new developer features and some important bug fixes. We recommend that customers upgrade as soon as possible. Important: Gravity Flow 2.4 requires Gravity Forms 2.3 or higher. The Approval step has a Revert feature which allows approvers to send the entry to a User Input step so the field values can be modified. In Gravity Flow v2.4, it’s now possible to send a special revert email which replaces the usual assignee email of the User Input step. This is useful if the workflow is reverted to a User Input step which was used before the approval. 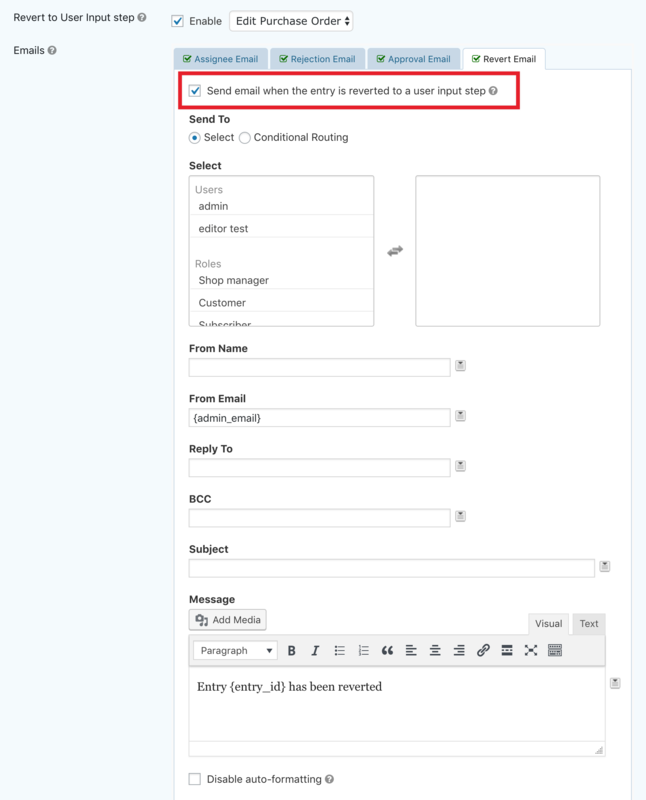 If the revert email setting is enabled then the assignee email of the User Input step will not be sent allowing you to tailor the message content to the context. The Gravity Flow integration with Gravity PDF now supports attaching multiple PDF per email. The example in the screenshot is the assignee email for the Approval step but Gravity PDFs can be attached to all the email settings including Workflow Emails in the Notification step. If your site is not using a dedicated email service then at some point it is almost guaranteed to run into issues with email delivery. For this reason, we strongly recommend that all customers use a dedicated email service instead of the built-in email service included with some hosts. 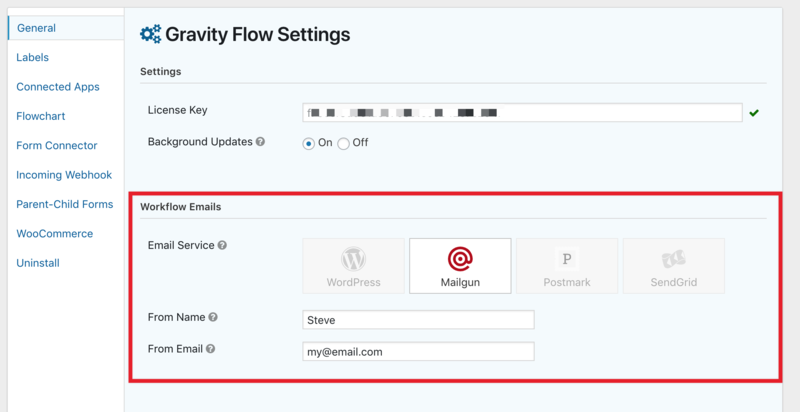 Gravity Forms has recently released add-ons for the most popular email services and now Gravity Flow administrators can configure workflow notifications to use the email service of their choice. 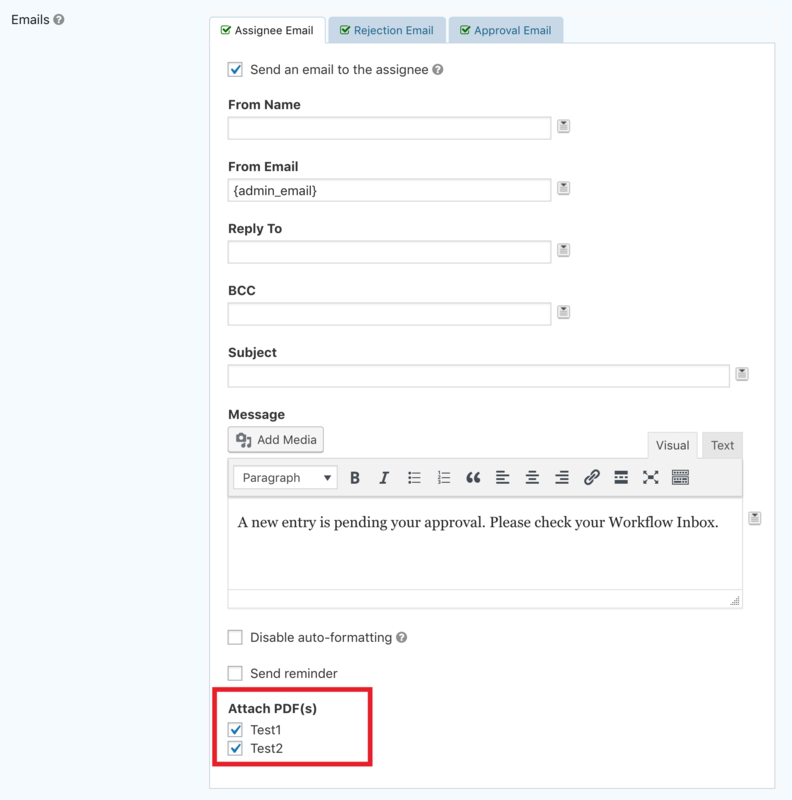 The Workflow Emails setting in the screenshot below demonstrates the options available when all three of the Gravity Forms Email Add-Ons are activate and configured. We’ve also added settings for the default From Name and From Email. Gravity Flow now supports the Gravity Forms REST API v2 as a connected app via OAuth1 authentication. This makes outgoing webhooks more secure and easier to configure. Gravity Flow v 2.4 adds support for the Repeater fields (beta) added in Gravity Forms v2.4. Currently, the Repeater fields can only be added using custom code, but once they’re on the form, they can be used in any workflow steps like Approval and User Input. For developers, we have added new methods for getting and counting inbox entries: Gravity_Flow_API::get_inbox_entries() and Gravity_Flow_API::get_inbox_entries_count() static methods. We’ve also added a new step setting. Look out for this in the upcoming versions of the Form Connector Extension. Added approval step setting for notification on revert (only displays when revert setting for user input step is selected). Added support for multiple Gravity PDFs to be sent with each email. Credit: The Team at Gravity PDF. Added settings for the Email Service, default From Name, and default From Email. 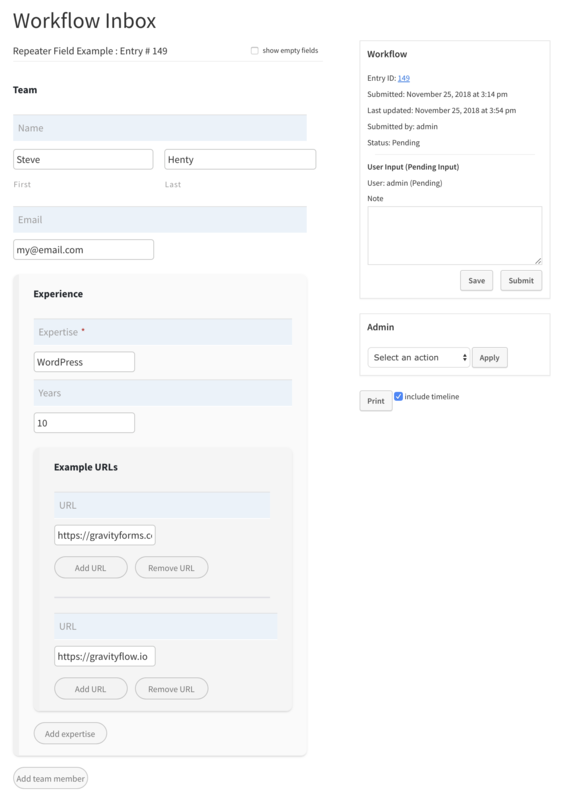 Added support for Gravity Forms OAuth1 connected apps for use in the Outgoing Webhook step. Added support for the Gravity Forms Advanced Post Creation Add-On. Added support for Gravity Forms Repeater Fields. Added the gform_order_summary filter enabling the GP eCommerce Fields Add-On to modify the location of discount and tax fields in the order summary table. Fixed status page step column from display expires date/time when step also has schedule queued. Fixed an issue where the file upload field appears to lose its value following progress save on the user input step. Fixed gravityflow_is_fulfilled entry meta being set when there are no steps to process. API: Added the entry filter step setting. API: Added the Gravity_Flow_API::get_inbox_entries() and Gravity_Flow_API::get_inbox_entries_count() methods.